New! Please click to see images of the new Nemasys and Nemaslug packs. Nemasys revised their application instructions in May 2016. There is a revised method of application for Nemaslug and the Nemasys range of products. The product is the same as before.The changes are meant to simply the application process and ensure an even dose. Nemaslug comes in two pack sizes, 40m² and 100m². If you have a larger area to treat you can use multiple Nemaslug packs it is best to apply each pack of Nemaslug individually. If the area is smaller then a stronger dose won't hurt, or you could treat an adjacent area. There is an important difference between metres square and square metres. To put it simply a large 100m² pack will treat an area that measures, for example, 10m by 10m. If you are treating a very large area then try marking sections off with a garden hose and treating each with a measured dose of Nemaslug. The watering can should be fitted with a coarse rose e.g. Haws No.14. When the nematodes are mixed with water the solution is very fluid, however a fine rose will quickly block, leaving all your Nemaslug in the watering can and none on the treatment area. Follow the instructions on the pack, which will vary depending on the size of pack you have purchased. Updated May 2016 For the 40m² Pack of Nemaslug. Empty the contents of the pack into a bucket containing 4 litres of clean water. Stir thoroughly to distribute the pack into the water. 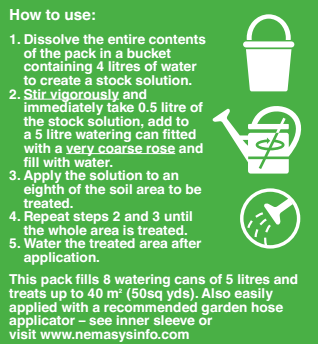 Take 0.5 litres of this stock solution and add to a 5 litre watering can, top up with clean water and apply to an eighth of the total treatment area. Repeat until all the stock solution is used (that should be 8 watering cans in total). The instructions for the large pack are the same except the stock solution is made up in 10 litres of water and you will need 20 trips with the watering can. Consider having a 'dry' run first with clean water so you know what pace to walk at to ensure an even application of Nemaslug. Use the whole pack and don't store made up solution. Please refer to the pack for the correct application rate and dilution. Applying Nemaslug is very simple, safe and clean. When treating very large areas it may be quicker to apply using a hose pipe and feeder. BASF, the makers of the Nemasys range and Nemaslug have approved two hose end feeders and provided instructions for their use. The Miracle-Gro Feeder is widely available for around £10. You can download the instructions for applying some Nemasys products including Nemaslug using a hose pipe. Nemaslug is fast and effective, but it will not kill a slug instantly on contact. The nematodes need to infect the slug, this may take a few days, the slug will then stop feeding and die. Large slugs, above about 8cm, are less vulnerable to Nemaslug. Most slugs and certainly juvenile slugs are active below the surface, Nemaslug is very effective at stopping a slug problem from developing. Pellets can be used alongside Nemaslug, should you feel the need. Nemaslug is particularly effective in wet conditions, when slugs are at their worst and pellets are at their least effective. Depending on soil and weather conditions a single treatment of Nemaslug will be effective for six weeks. It is a good idea to apply at the start and end of the season (March/April and October/November) to kill off early generations and those over-wintering for the following season. A full season's continuous treatment would take 6 x 6 weekly applications, that is 6 packs in total (depending on the area treated). You should get Nemaslug delivered when you need to apply to ensure the nematodes are fresh.